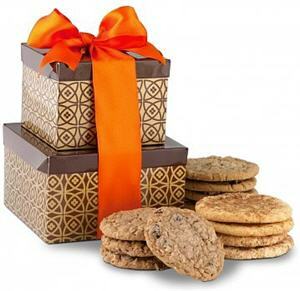 Satisfy any sweet tooth with the double delight of two gift boxes filled with fresh baked cookies. Inside the recipients will discover one dozen cookies in the classic flavors of Snickerdoodle, Chocolate Chip, and Oatmeal Raisin. These rich and soft one ounce cookies are baked to perfection using premium ingredients such as Guittard Chocolate and natural sea salt. Simply delicious! Cookies arrive individually wrapped for freshness. Measures 6" x 5" x 5".